Do you feel curious about how the aircraft flies high in the air or how atellites up there transmit telephonic and TV signals? Or how does a non-living thing travels and even sends us pictures of outer space while there is no person handling it. Ever wonder what makes a paper plane fly? Are you fascinated by electronics and computers? Like the smell of gasoline? Are you a hands-on kind of person? Well then, Aerospace Engineering is the career for you. Aeronautical/ Aerospace Engineering is the science or art which is involved with the study, design, and manufacturing of air flight-capable machines, and the techniques of operating aircraft and rockets. It is one of the most challenging fields of engineering with a wide scope for growth. This field deals with the development of new technology in the field of aviation, space exploration and defense systems. It specialises in the designing, construction, development, testing, operation and maintenance of both commercial and military aircraft, spacecrafts and their components as well as satellites and missiles. This branch mainly deals with the technology, business and other aspects related to aircraft. One of the significant parts in aeronautical engineering is a branch of physical science called aerodynamics. It deals with motion of air and the way in which it interacts with objects in motion, such as an aircraft. Aeronautical Engineering is a part of Aerospace Engineering, while Astronautical Engineering another branch of the core field, deals with spacecrafts operating outside the atmosphere of Earth. As Aerospace engineering involves design and manufacture of very high technology systems, the job requires manual, technical as well as mechanical aptitude. Aeronautical engineers usually work in teams under the supervision of senior engineers, bringing together their skills and technical expertise. Though highly paid, the work is very demanding. An aeronautical engineer needs to be physically fit and fully dedicated to his work. To be a successful Aeronautics engineer, you need to be alert, have an eye for detail and a high level of mathematical precision. · Production methods or it can be in a particular product such as military aircrafts, passenger planes, helicopters, satellites, rockets etc. The duration of the bachelors degree programme, B Tech/ B E, is four years, while diploma courses are of 2-3 years duration. The M Tech/ MS is typically for two years. · Research & development – Those interested in R&D can design a satellite launcher, test the latest environment-friendly turbine or create the latest fighter plane as part of the production team. · One may also consider joining the human resources team of a large aerospace manufacturer to develop strategies for attracting, recruiting and retaining skilled employees. During the design process of an aircraft, the aerodynamicist works with other design engineers to make sure that the airplane moves easily through the air. The design engineer, on the other hand, decides how long a plane has to be to hold a certain number of people, how wide it should be, where the wings need to be and how strong the materials should be. As an electronics engineer, One can design the sensors and connections that tell the pilot of an aircraft that things are fine or that there is a problem. Mathematicians are also hired by the aerospace industry and if you are wondering why, these are the ones who develop the math formulae that engineers use to design their work. The physicist is another behind-the-scenes part of a design team, analysing a scientific problem for the aircraft such as overcoming the heat barrier or computing a trajectory. Jobs are available with the national, international, public and private Airline Services as well as aircraft-manufacturing units. One can also explore opportunities with various airlines like Air India, Helicopter Corporation of India and flying clubs, private airlines and government owned air service and aircraft manufacturers like the Hindustan Aeronautics Ltd. (HAL) with its factories at Bangalore, Nashik, Koraput, Kanpur etc. Defense Research and Development Laboratories, National Aeronautical Lab (NAL), Aeronautical Development Establishment, Civil Aviation Department etc. Initially, candidates begin work as graduate engineer trainees or junior Engineers. 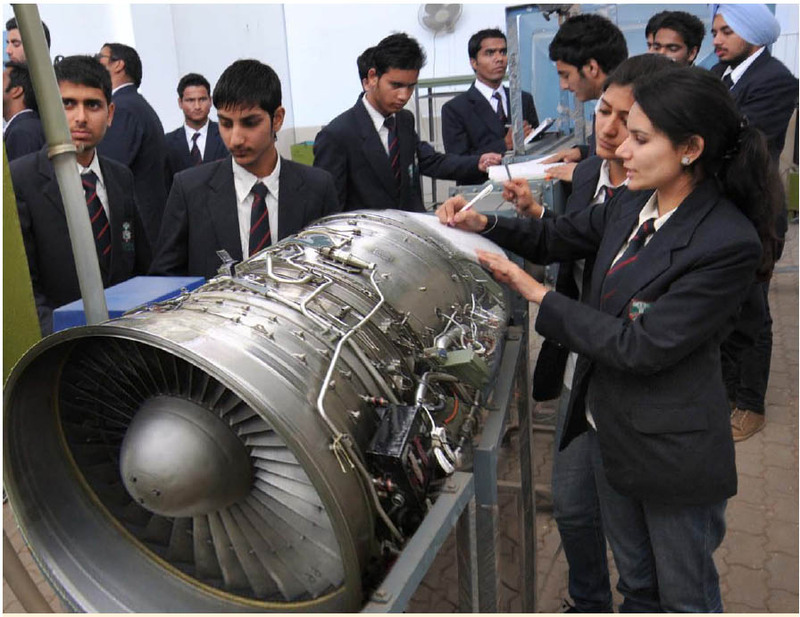 Keeping in view their performance, academic background and aptitude, they are placed for training in the aircraft maintenance/overhaul or support section. On completion of training they are placed as assistant aircraft officers. They have to clear departmental examinations for further promotions. They may advance to administrative or executive positions or become consultants. Aeronautical engineers are assisted by aircraft mechanics in maintenance of aircraft frame, engine, electrical system and other ancillary fittings. To sum it up, companies, while recruiting, look at the combination of a consistent academic record, deep understanding of the subject matter and good communications skills. According to Confederation of India Industry (CII), India’s Aircraft MRO segment (Maintenance, Repair and Overhaul) is estimated to grow at 10% and reach USD 2.6 billion by 2020. · Punjab Engineering College, Chandigarh. · The Indian Institute of Science (IIS), Bangalore has M Tech and Ph.D programmes in Aeronautics. (The lists are indicative only) The Indira Gandhi National Open University (IGNOU) has also started a B.Tech programme in aeronautical engineering in ‘on campus’ mode. Pune-based Aeronautical Engineering and Research Organisation (AERO) has developed course curriculum to facilitate the programme.